Citizens are fighting back when the legislature ignores the Constitution! - Click here for our audio downloadpage. Click here for the vaccine issue page. Article V Convention Resource Page (click here) Includes 36 questions that should be answered before calling for a convention. SAPA (Second Amendment Preservation Act) Resource Page (click here) Live interactive database of all ballot initiatives. Print the PDF version of this poster. Ask your local gun stores to display it. Tape a copy inside your car or truck window! 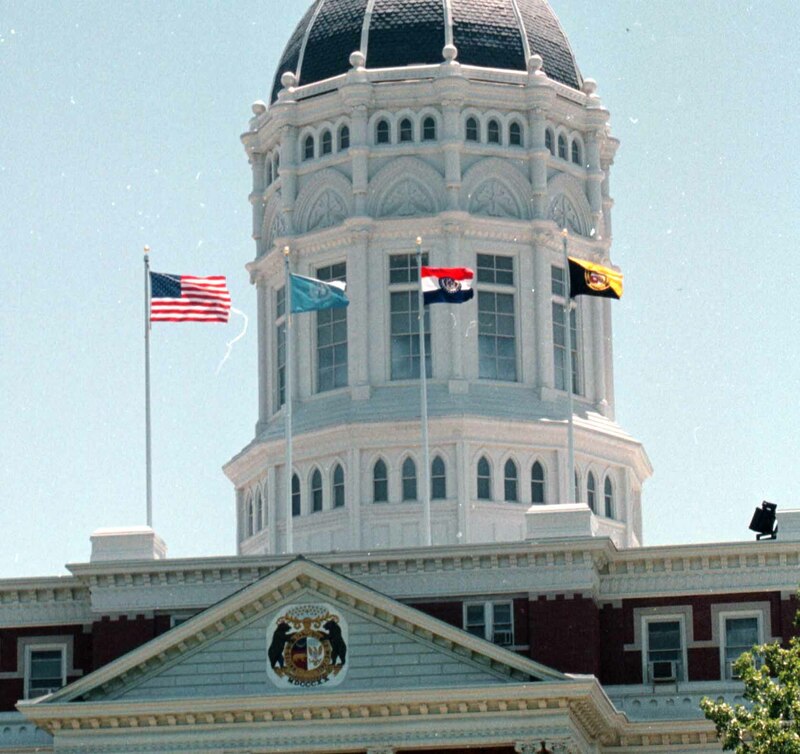 Citizen sues Missouri legislature for not respecting the constitutional limits on their power. 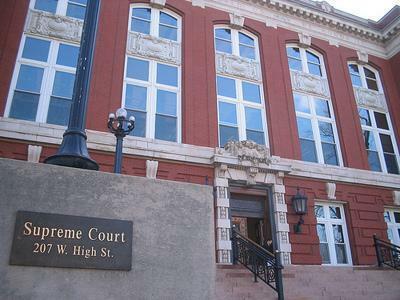 January 15, 2019 - Missouri Supreme Court heard oral arguments and is considering these cases. Challenge to 2016 Senate Bill 638 for violating the Missouri Constitution's requirement that bills stick to their one original purpose. To see details about the case CLICK HERE. Challenge to Senate Concurrent Resolution 4 (application to Congress for a constitutional convention) because the resolution is not being sent to the Governor for his consideration as required by the Missouri Constitution. Jefferson City, MO, September 26, 2016 – Nearly two years after a complaint was illegally filed against one of Missouri First's directors, Ron Calzone, a Cole County circuit judge has ruled that the Missouri Ethics Commission acted outside it's legal authority when it accepted and pursued the complaint filed by the Missouri Society of Governmental Consultants. The complaint alleged that Calzone was required by law to register and fill out reports the same way professional lobbyists do, even though he has never been compensated for his time spent as a citizen activist. The Missouri Society of Governmental Consultants is an association of professional lobbyists who are hired to promote the agenda of special interests. Over many years, quite a few citizen activists, like Calzone, have been very successful in defeating legislation that would undermine free-market principles and profit some of those lobbyists and their principals, even though the activists receive no compensation or spend money on law-makers. The Missouri Ethics Commission is a group of people appointed by the governor to enforce the laws pertaining to campaign committees and various types of lobbying, among other things. They have staff attorneys who decide what complaints to investigate and then, in administrative hearings closed to the public, try to convince their bosses who should be punished. Missouri First believes the starting point in a legislator evaluation is determining their commitment to adhering to the Constitution they took an oath to support. Such an evaluation can be done in a very “quantitative” way that removes most, if not all, of the subjectivity (opinion) from the process. Unfortunately, out the 194 representatives and senators currently in the Missouri General Assembly, only four produced scores that indicate a consistent commitment to the most basic of constitutional instructions about the legislative process. Jefferson City, MO, February 17, 2016 – After over 8 months of litigation, Cole County Daniel Green declared that the 2014 SB 672 was passed by the Missouri General Assembly using procedures that are forbidden in the state Constitution. Similar violations have become commonplace. This case paves the way for similar challenges to other unconstitutional bills in the future as other non-attorneys see that they can prevail. 4. Each party to bear their own costs. To read more about the case and access court documents <click here>. Section 21. The style of the laws of this state shall be: "Be it enacted by the General Assembly of the State of Missouri, as follows." No law shall be passed except by bill, and no bill shall be so amended in its passage through either house as to change its original purpose. Bills may originate in either house and may be amended or rejected by the other. Every bill shall be read by title on three different days in each house. Section 23. No bill shall contain more than one subject which shall be clearly expressed in its title, except bills enacted under the third exception in section 37 of this article and general appropriation bills, which may embrace the various subjects and accounts for which moneys are appropriated. Since the September order, my First Amendment legal team has filed an appeal to the Administrative Hearing Commission, and just last Friday they filed a motion for a Judgment on the Pleadings. How should Missouri respond to the Syrian refugee situation? Since immigration and naturalization are clearly constitutional functions of the federal government, what can Missouri do, constitutionally, if we decide that we don't want refugees resettled here? I'm proud of my friends who have asked what the Christian's responsibility is in the matter. What does the Bible teach about situations like this? How should that affect what Missouri decides to do? How should that affect what Christians should do? We'll explore the constitutional and scriptural answers to all of those questions in detail, below, but we'll start with a summary answer and warning about empty political responses to the overwhelming public outcry against resettlement of these unfortunate refugees in the United States. Ask your state rep and senator to commit fo settling for nothing less than a new law that establishes legislative oversight of refugee resettlement. We reported that Missourian's gun rights would be in the balance in the Missouri Supreme Court this Tuesday, Oct. 27. This is a call to action – please watch history in the making by attending the two hours of very interesting hearings. Frankly, I was resigned to the prospect that the Court would once and for all gut Amendment 5, but just yesterday there was a game changer. In an unprecedented turn of events, the Freedom Center of Missouri learned that they would be given the entire thirty minutes to make their very principled and constitutional argument in defense of Amendment 5. The Freedom Center's attorney, David Roland, had filed an amicus brief in both cases, and now the attorney for one of the defendants has asked Dave to take ALL the argument time on behalf of his client -- and Amendment 5. If you will invest a little time reading this brief, you will understand the power of Amendment 5, as intended by General Assembly and the voters. You will also clearly see that the Supreme Court's responsibility is. On August 5, 2014, over 60% of Missouri voters ratified Amendment 5 and thereby added to the Missouri Constitution sweeping new protections to our right to keep and bear arms. Since then, the Missouri Supreme Court has been on a course of systematic nullification of the People's will. It started with an after-the-vote challenge to Amendment 5's ballot title. Although the court found the ballot title “fair and sufficient”, they explained that their ruling was based on the assumption that Amendment 5 didn't really add any new protections to our rights. That set the court up to mold the amendment into their own liking. Next came two criminal court cases in which both defendants had been accused of violating a state law that prohibits felons – all felons – from possessing a firearm. The alleged violations were before Amendment 5 passed. The two men had previous convictions for felonies not related to any violence. Since Amendment 5 only allows the state to pass laws restricting the gun rights of “convicted violent felons”, both defendants claimed protection under the new constitutional provision. The prosecutors appealed and the Supreme Court decided that the new standard didn't apply to them, since they were arrested before August 5th. Nonetheless, the Court took that opportunity to inject some “dicta” in their written opinion that they could later use as an excuse to unravel Amendment 5. Jefferson City, MO, September 11, 2015 - The Missouri Ethics Commission issued a Consent Order, directing Ron Calzone to register as a lobbyist or cease exercising his free speech rights. Calzone maintains that he does not fall under the statutory definition of a legislative lobbyist. In recent years citizen activists have turned the tide on a lot of legislation in Jefferson City. In many instances they have made powerful politicians and high paid lobbyists look pretty lame. The unpaid citizen is a threat to their power base because we can't be bought off and there's no threat to our job security. From time to time the power brokers have resorted to political threats of one sort or another in their effort to squelch us. Using the Ethics Commission as a political weapon is one of their tactics. Link: A message from Ron Calzone - case details. Jefferson City, MO, May 29, 2015 - A lawsuit challenging the constitutionality of SB 672, passed by the Missouri General Assembly in 2014, was filed in Cole County circuit court on May 29th. The lawsuit claims that the General Assembly ignored the constitutional limits to their legislative authority. The Missouri Constitution includes clauses that prohibit legislators from changing the purpose of a bill, including multiple subjects in one bill, or passing a “special law” that fails to treat everyone equally. Additionally, the lawsuit seeks to establish “citizen standing” in court to make such legal challenges. Courts currently recognize “taxpayer standing”, or the right of taxpaying citizens to sue when the law being challenged somehow affects the taxes he pays, but “standing” is not guaranteed a citizen if neither taxation nor government expenditures affect him. If the “citizen standing” claim is recognized by the courts, the door will be opened for similar suits even when the laws being challenged don't affect the taxes of the person filing the lawsuit. The plaintiff in the challenge is Ron Calzone, a political activist and one of the founding directors of Missouri First, Inc., a think tank devoted to promoting constitutional governance. Although not an attorney, Calzone filed the suit “pro se” (Latin, “for oneself”), in part to demonstrate that the abuses by the General Assembly are so blatant that even a non-lawyer can succeed in legal challenges against some of their bills. He also hopes that it will encourage other citizens to bring similar challenges as long as the General Assembly refuses to abide by the constitutional limits on their powers. It was the worst vote in recent Missouri history, but the House may break the record this week. It was, arguably, the worst vote ever taken by either house of the Missouri General Assembly. It was April 14, 2011 and a unanimous vote by the House of Representatives to 3rd Read and Pass HB 609, the bill that would have set up a state Obamacare exchange. Largely due to the fast work of grassroots activists, HB 609 was stopped in the Senate. Of course, in retrospect, we know just how bad it would have been to set up a state exchange, since non-cooperation by Missouri and a majority of the other states states will be a major factor in dismantling Obamacare. On top of that, we now know that the opponents of HB 609 were right about the ongoing cost to the states that did set up exchanges. In the news today we learn that the Hawaii legislature was faced with the decision to spend over $30 million to bail out their exchange or let it go belly up. They made the right decision – the one they should have made from the start. 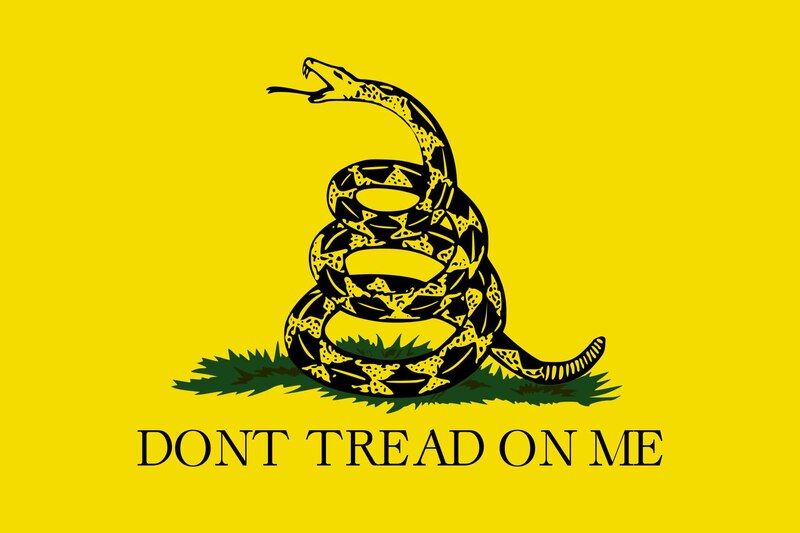 Many people who normally agree on political issues are on opposing sides of the Article V convention issue (aka, “Convention of the States” or “COS”). In an epiphany moment, though, I realized how to boil the entire issue down one simple indisputable and decisive fact. The realization of this elementary fact is a game changer for anyone who might be on the fence or even a supporter of a COS. Article I, Section 4 of the Missouri Constitution requires that proposed amendments to the U.S. Constitution be considered for ratification by "conventions of the people". In spite of that, some of the legislation being considered by the Missouri General Assembly calls for ratification of proposed amendments by legislators. Supporting such legislation is a violation of a law-maker's oath of office. Two COS bills passed the Senate and are being considered by the Missouri House of Representatives. Go to our Article V Convention Resource page for a list of questions that should be answered BEFORE asking Congress to call a convention. You will be surprised at how many unknown variables there are. In anticipation of civil unrest in Furguson, on November 17, 2014 Governor Jay Nixon issued Executive Order 14-14, declaring that State of Emergency exists in the State of Missouri. That declaration was not legally proclaimed. Under Missouri law, the declaration of emergency and the assumption of what could easily be considered dictatorial powers by the governor, applies to the entire state, not just some region suffering from a disaster or civil unrest. The powers the governor assumes during a state of emergency are enumerated in Chapter 44.100 RSMo. They include the power to “Seize, take or requisition... Any means of transportation, other than railroads”, “Any communication system”, “All stocks of fuel”, and “Facilities for housing, feeding and hospitalization of persons, including buildings and plants”. The declaration of a State of Emergency is no small matter. Amendment 5 (SJR 36) Will Give Missourians the Strongest Constitutional Gun Rights in the Country! The most important part of Amendment 5 is requiring the courts to use the most stringent standard of review (strict scrutiny) when someone challenges the constitutionality of a law infringing on gun rights. When the Ballot Title for Amendment 5 was in the Missouri Supreme Court, the anti-gunners argued that the new requirement for "strict scrutiny" would turn gun rights jurisprudence on its head. See the attached brief from the Amendment 5 ballot title challenge. Note the 39th page (Page 27 of this document). That page is the first bookmark and the document should open there. Missouri has many statutes dealing with weapons. Those statutes are currently presumed constitutional unless they “clearly and undoubtedly” violate the Constitution and “palpably affront some fundamental law embodied in the constitution.” State v. Richard, 298 S.W.3d 529, 530 (Mo. banc 2009). Under current law, the state has the “inherent right to regulate the carrying of firearms as a proper exercise of police power.” Id. at 532. Strict scrutiny is a horse of a different color. Neither this Court, nor the U.S. Supreme Court, has ever said that strict scrutiny should apply to gun laws. See e.g.,District of Columbia v. Heller, 554 U.S. 570, 629 (2008) (striking District of Columbia total ban on handgun possession in the home because it fails constitutional analysis “under any of the standards of scrutiny that we have applied”). See also, Eugene Volokh, Implementing the Right to Keep and Bear Arms for Self-Defense: an Analytical Framework and Research Agenda, 56 UCLA L. Rev. 1443 (2009). scrutiny review requires that a restriction “serve compelling state interests and be narrowly tailored to meet those interests.” Weinschenk v. State, 203 S.W.3d 201, 211 (Mo. 2006). If adopted by the people, SJR 36 would abandon the current analytical framework in Richard for the strict scrutiny standard of review. As attorney Chuck Hatfield has pointed out, the SCOTUS and Missouri courts have used what amounts to the rational basis test when examining laws that infringe on the tight to keep and bear arms. The bottom line is that everyone -- including convicted felons and those accused of being mentally infirmed, for the first time in Missouri history, will enjoy the defense of the strongest legal standards. Chuck Hatfield is one of Missouri's sharpest attorneys and he has explained, here, the very legal mentality Amendment 5 is designed to thwart. I believe that SJR 36 / Amendment 5 provides the road map for constraining the courts to properly respect and defend our rights in a LOT of areas. They SHOULD already be using strict scrutiny, the highest standard of review, where ALL our rights are concerned. Nullification for Lawyers. More in depth on Marbury. “I maintain that the word supreme imports no more than this — that the Constitution, and laws made in pursuance thereof, cannot be controlled or defeated by any other law. The acts of the United States, therefore, will be absolutely obligatory as to all the proper objects and powers of the general govennment...but the laws of Congress are restricted to a certain sphere, and when they depart from this sphere, they are no longer supreme or binding” (emphasis added) (Alexander Hamilton, at New York’s ratifying convention). Critics of nullifiaiton claim it has racist roots and that nullification has never worked, but Mike Maharrey gives specific examples of it's successfull use defending black Americans from the unconstitutional Fugitive Slave Act in the 1800s. This is one of the best written refutations of the objections to the Missouri Second Amendment Preservation Act. JOPLIN, Mo. — In a few weeks, the Missouri Legislature will consider overriding Gov. Jay Nixon’s veto of a bill nullifying federal actions violating the Second Amendment. As the debate rages, opponents of House Bill 436 make two fallacious arguments. First, they argue the Constitution’s supremacy clause renders the bill unconstitutional. Second, they paint nullification as a discredited tool primarily used unsuccessfully to fight desegregation. Nixon cited the supremacy clause as his reason for vetoing the bill. “To me, it is not a gun issue, it is a law issue,” he said. The supremacy clause affirms that the Constitution and all laws made “in pursuance thereof” stand supreme. Ironically, Governor Nixon chose July 5th to veto the Missouri Second Amendment Preservation Act (HB 436). The day after we celebrated the 237th anniversary of our Declaration to King George III that the People are “endowed by their Creator with certain unalienable Rights”, the governor became an obstacle to the General Assembly, who are living up to their OATH to defend those rights – the same oath the Governor took. The Declaration of Independence was precipitated, among other things, by the king's effort to disarm the Colonists. The “shot heard around the world” was fired by – or at – British troops sent to confiscate the arms stored at Concord. After several grueling years of war, the newly declared sovereign states beat back one tyrant, but they were afraid that the new federal government they were creating might some day also try to disarm and subjugate the People. Some states refused to ratify the proposed constitution without clear, unambiguous statements securing their unalienable rights and limiting the power of the federal government – they demanded a Bill of Rights in addition to language that limited that government to a small set of defined powers. The full meaning of the Second and Tenth Amendments in the Bill of Rights have been ignored too long. A proper understanding supports the General Assembly's decision to pass the Second Amendment Preservation Act. The federal government possesses only the powers specifically granted it in the Constitution and nowhere does the Constitution delegate power to Congress to regulate gun ownership in the states. The Second Amendment in the Bill of Rights was aimed directly at the federal government, and it explicitly prohibits the federal government from infringing on the right to keep and bear arms. As sort of a punctuation mark to the new Constitution, the Tenth Amendment topped off the Bill of Rights, making it clear, in no uncertain terms, that the States or the People have ALL powers not delegated to the feds. In the spirit and authority of both the Declaration and the Constitution, the Second Amendment Preservation Act is the State of Missouri asserting the powers “reserved” to the States and the People. The Act does not attempt to tell other states what they should do, but is does avow that Missourians' rights will be defended in their home state. By passing the Act, our state legislators were doing what the Missouri Constitution calls “the principal office of government”, that is, defending the liberty of the People – in this case, from unconstitutional federal edicts. For the state to do less, Article I, Section 2 says, is to “fail in its chief design”. Governor Nixon's administration's release of the private information of 163,000 CCW holders to the Social Security Administration is reason to believe he is hostile to the People's Second Amendment Rights. Now his veto of the Second Amendment Preservation Act fuels those concerns. The Governor's claim that the Act violates the Supremacy Clause (U.S. Const. Art. VI) rings hollow and an examination of that clause, and what the Founders said about it, defies his claim. The governor seems committed to the preposterous notion that only the federal government, itself, can determine when an edict of Congress is “in pursuance” of the Constitution, but that would leave the federal government free to determine the extent of its own power and the states that created the federal government with no say. That's a dangerous doctrine, fit for the subjects of despots, but not free citizens. Grounded in the principles of the Declaration, the doctrines of interposition and nullification as legal and political tools to fight unconstitutional acts of government is part of the heritage of a free people. The colonists successfully used it against the king's illegal and oppressive edicts, like the Navigation Acts and the Stamp Act. And the Kentucky and Virginia Resolutions of 1798 & 1799 saved an unknown number of newspaper editors in those two states from fines and prison when they nullified the the unconstitutional federal Sedition Act, which outlawed criticizing the federal government. Besides protecting newspaper men, one happy effect of the Kentucky Resolution was the election of its author, Thomas Jefferson, to president in 1800. Later, in an era when the U.S. Supreme Court said in the Dred Scott Opinion that it was legal to relegate black men, women and children to sub-human status, several states defended the liberty of accused run-a-way slaves by nullifying the unconstitutional Fugitive Slave Act. In fact, their nullification of the Fugitive Slave Act was so effective that South Carolina listed it in their "declaration of causes" for seceding from the Union. In increasing numbers, Americans are dusting off the pre-revisionist history books and are waking up to an understanding of the heritage that's been stolen from them. A May 13, 2013 Rasmussen Poll found that a majority of “mainstream voters” now support the use of nullification against unconstitutional federal acts. Fortunately for the People, the General Assembly will likely override Governor Nixon's veto. Unfortunately for the governor, he will go down in history as one who missed the opportunity to prove his campaign claims that he supports gun rights. It's too bad he didn't follow the lead of the governor's of Kansas and Alaska, who both recently signed similar legislation. SJR 14: Constitutional Amendment greatly strengthening the right to keep and bear arms. This is actually the most important gun bill of the session. Status: Waiting for the House General Laws Committee to report the bill out (Has been voted "do pass" by that committee.) This measure only needs one more vote by the House to be placed on the ballot for voters to approve. We don't want any amendments, otherwise it will have to be voted on by the Senate again, and that will probably kill it. Action: Call your state representative and ask them to tell House leadership that this bill is a must-pass. Bring it to the floor for a vote without ANY amendments. SB 210: Requires the Dept. of Education to hold public meetings to answer questions about the intrusive Common Core Standards. If fully implemented, the Common Core Standards program will track hundreds of pieces of personal information about public school children in a national database. Witness Form - We will hand deliver your witness form and also make your testimony available online for the committee to read. Please be sure to make some brief comments..
Action: This bill does a lot to address the Department of Revenue scandal, but still lacks an important provision to hold directors of state agencies accountable. Ask your state representative to support an amendment to put HB 886 on SB 252. That will give the legislature the power to remove directors and deputy directors of state agencies, like the DoR, with a process similar to impeachment. Status: This bill is not quite as far along as SB 252. It has been voted "do pass" in the senate committee, but has not been placed on the calendar. Action: This bill also does a lot to address the Department of Revenue scandal, but still lacks an important provision to hold directors of state agencies accountable. Ask your state senator to support an amendment to put HB 886 on HB 787. That will give the legislature the power to remove directors and deputy directors of state agencies, like the DoR, with a process similar to impeachment. As always, thanks for taking your stand for liberty! Senate Bill 210 needs your immediate action! Fill out and submit this online witness form TODAY to show your support of SB210! SB 210 requires Commissioner of Education Chris Nicastro to hold public meetings in all 8 congressional districts. She will be required to report ALL costs to the state and school districts and report facts about the data collection associated with implementing Common Core State Standards. This is to support SB 210 which holds DESE accountable by reporting to the public: the costs to the state and to school districts for the implementation of Common Core State Standards in MO; and, describe any data that shall be collected as a result of the implementation of the Common Core State Standards, and any governmental entity, quasi-governmental entity, or consortium that collects data or receives data as a result of the implementation of the Common Core State Standards. Commissioner Nicastro and the State Board of Education are public servants who should provide transparent information for the public before fundamentally transforming public education with standards copyrighted to private, Washington-based, trade organizations (the National Governors Association and the Council of Chief State School Officers), and joining an assessment consortium that, in effect, diminishes state sovereignty by reducing control of Missouri's student testing to one vote in a collective of over 25 states. I also support that no additional amendments will be made to SB210 either in committee or on the floor of the House during debate. The goal is 1,000 witness forms! Witness forms needed for SB 210 (Common Core) by Monday morning! Witness Form - SB 210 will force the Dept. of Education to disclose the real effects of the new Common Core Standards program they intend to have fully implemented in the fall of 2014. That information will empower the legislature to act accordingly next spring. UPDATE! On the evening of May 8, the Missouri House finally agreed to and passed the Missouri Second Amendment Preservation Act by a vote of 116 to 39. The next step is the Governor's signature. More details later, but for now thanks for everyone who helped!! Passes the full Senate 28 to 4! so the last step is for the House to vote to accept those changes. There's more to this story than we can go into right now, but suffice it to say that the most difficult part of this process, getting a passing vote from the Senate, is behind us. Technically, the next step is for the Senate to formally ask the House to accept their version of the bill. If the House does, and we're confident they will, the House needs to take one more vote to accept the finished product. The last time they voted on this bill it passed 115 to 41. An amendment added to the original HB 436 by the House which imposed mandatory penalties was removed. Here's the removed amendment. Two amendments were added on the Senate floor. As you can see, the Senate changes do no harm to the underlying bill. to place it on the calendar. Thank you to all who filled out a witness form for the Senate hearing. Your participation is truly making a difference! General Laws chairman, Sen. Brian Nieves, scheduled this special hearing and expedited the process by holding an executive session on the bill at the same hearing. They voted to pass the bill on to the full Senate by a vote of 4 to 1 (a couple of senators were not present). The next step for this bill is to be placed on the Senate calendar by president pro tem of the Senate, Tom Dempsey. Sen. Dempsey was quick to assign it to the General Laws committee, so we expect him to do the same for the next step. Once on the calendar, it will be up to majority floor leader, Sen. Ron Richard, to bring it to the floor for debate and "perfection" by the whole senate. After that, the senate will have one more up or down vote. Sen. Richard will need to allow it enough time to overcome opposition and potential filibuster. The last step will be hammering out any differences between the language in the bill as it passed the House versus what the Senate passed. “I maintain that the word supreme imports no more than this — that the Constitution, and laws made in pursuance thereof, cannot be controlled or defeated by any other law. The acts of the United States, therefore, will be absolutely obligatory as to all the proper objects and powers of the general government...but the laws of Congress are restricted to a certain sphere, and when they depart from this sphere, they are no longer supreme or binding” (emphasis added) (Alexander Hamilton, at New York’s ratifying convention). Fill out Witness Forms Now! HB 436 passed the House 115 to 41. Good Video report on passage of HB 436. After being assigned to committee, the next step is another public hearing. That hearing is now scheduled. As we did in the House, we need to make a loud and unmistakable statement about the People's desire to pass this bill asap! This hearing is a special hearing called by the committee chair, Sen. Brian Nieves. There will be very little time for testimony, but just being at the hearing makes a strong statement. If you can't make it to the hearing, please fill out a witness form. Witness Form - I will hand deliver your witness form and also make your testimony available online for the committee to read. Rep. Doug Funderburk and Sen. Brian Nieves' "Second Amendment Preservation Act" is the strongest and most principled protection of the right to keep and bear arms in the nation!. received the first of two approvals required in the House! For any bill to become law, it must first receive a "perfection" vote and then a "3rd read" vote in both the House and the Senate -- 4 votes total. * HB 436, the Missouri Second Amendment Preservation Act, has passed the first of those four tests by a vote of 117 to 39. The next step, probably Thursday, will send the bill to the Senate, where it needs a hearing and committee vote before going to the full Senate. The Senate will be a tougher fight, so we need to stay vigilant! Come to the rally at the Missouri Capitol and you will probably get to watch the House pass HB 436! Listen to great speakers and pass out the I Support Missouri's Second Amendment Preservation Act posters! * There are also committee votes and there could be more vote by the full House and Senate, if the bill receives more amendments. Tenth Amendment Center article about SB 325 & HB 436. Download and Post this sign everywhere! the liberty of the People! By now, you probably know quite a bit about Missouri government agencies playing loose and free with your personal information – including firearms related data. As the Senate investigation proceeds, the situation seems to be going from bad to worse. Previously, we learned that the Department of Revenue was illegally complying with the intrusive federal REAL ID Act and installing new equipment that would upload your personal data to a 3rd party which is being monitored by Homeland Security when you get your driver's or CCW license. Now the Senate has discovered that at least twice the Missouri Highway Patrol has sent the entire list of CCW holders names and addresses to a federal agency, breaking more than one Missouri law in the process. The deputy director of the Missouri Department of Public Safety, under which the Highway Patrol functions, denies any wrongdoing and says they would do it again. Both the House and Senate are livid. Sen. Kurt Schaefer will be conducting hearings around the state to get citizen input and Speaker Tim Jones is planning a fly-around the state to raise awareness of the situation. Additionally, legislation is advancing that will make it clear in no uncertain terms that state departments must protect our personal data. There's one huge problem, though. The General Assembly has very little recourse when rogue department directors refuse to follow the law. The Governor is the only one who can fire them. Simply threatening to cut budgets is not enough. That's where HB 886 (Rep. Kurt Bahr) comes in. This bill empowers the legislature to remove agency directors and deputy-directors who they feel are misusing their power. Similar to the traditional impeachment process, a removal under HB 886 originates in the House and requires the Senate to agree that it's in the best interest of the People to remove the Governor's appointee. HB 866 is the “law” that will provide for such removal, and that's good news for anyone concerned about their Second Amendment rights or the security of their personal data. Even better news is the fact that both House and Senate leadership have made it clear that HB 886 is high priority. Even though this bill was filed right before the cutoff date, it has been fast-tracked and will get a hearing this Monday. That's where you come in. Please either plan to attend the hearing, or fill out a witness form for us to print and deliver to the committee on your behalf. Please be sure to leave comments on the form – we are providing an easy way for legislators to read them. This bill is on the fast track now, and your input will help keep it that way! Missouri Senate Passes SJR 14! Missouri Senate senator Kurt Schaefer continues to lead the way where defending the right to keep and bear arms is concerned. Thursday SJR 14 was passed by the entire senate with a vote of 29 to 2 (3 were absent). SJR 14 has also been "first read" in the House, so the next step is for it to be second read and assigned to a committee which will hold another public hearing, vote on it and, hopefully, report it to the whole House, which in turn has to vote on it twice. Then it bypasses the governor and goes straight to the ballot for voter's approval. Although the Missouri Senate has been doing a good job advancing gun rights bills, the House has been painfully slow getting anything done. Hopefully, they will not let SJR 14 bogg down like HB 436 has. Recall that Second Amendment Preservation Act (HB 436 and its companion in the Senate, SB 325) is the key to defending us against federal infringement of our gun rights. SJR 14 is, in trun, key to defending the Second Amendment Preservation Act. We must continue to press for all three of these acts. Please don't let up! The Missouri Senate, particularly, Sen. Kurt Schaefer, is not going to settle for the evasive answers given by the Director and Deputy Director of the Missouri Dept. of Revenue at an earlier hearing. Legislators have no greater responsibility than to protect our core liberties! The Missouri General Assembly is back in session Monday, March 25 after a week long spring break. There are only 2 months left in the Missouri General Assembly's legislative session. Every passing day decreases the chances any bill has to pass and our state legislature is on vacation this week. We must work while they are on break!. The new attacks on our right to keep and bear arms are moving faster in Congress than the protection bills are moving in the Missouri legislature. The U.S. Senate Judiciary Committee has passed bills to require universal background checks AND an assault weapon ban. Pundits say those bills won't pass the full Senate or the House, but federal and state agencies are implementing programs that are eroding the right to keep and bear arms piece by piece. The actions of the Veterans Administration and the Missouri Dept. of Revenue's collaboration with the Dept. of Homeland Security are prime examples. Meanwhile, the only thing even through the committee process in Missouri is SJR 14, which is good, but only part of the solution. If we don't step up our effort we will lose! Our goal MUST be to pass either HB 436 or SB 325 and put it on the governor's desk within the next 30 days. Why 30 days? Missouri law requires the governor to either sign, veto, or let a bill become law without his signature within 15 days of receiving it from the legislature if there are more than 15 days left in the session. If he vetoes it, the legislature can, then, override the veto during the remainder of the session. If legislators won't commit to this time-table we must seriously question their commitment to protecting our Right to Keep and Bear Arms! Waiting any longer may very well kill our opportunity! 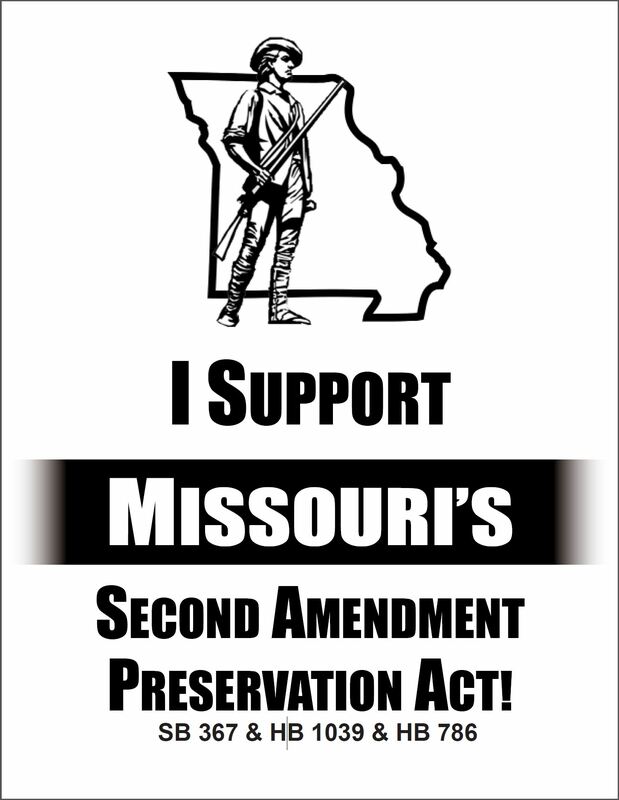 Download, print and post the "I support Missouri's Second Amendment Preservation Act" poster. (Right sidebar) Especially post it where your state rep and senator will see it, like political gatherings and meeting. Do it this week, while they are back home in their district. Send or hand deliver both your rep and senator a copy of the poster and ask them to post it in their office. Tell them that you expect them to deliver either HB 436 or SB 325 to the governor by April 17th, or you will lose all confidence in their commitment to protect our right to Keep and Bear Arms. Tell them you want results, not just effort, and if they can't produce results to get out of the way and let others who will protect our rights take their office. Do everything you can to publicize the controversy over the MO Dept.of Revenue collaboration with the Dept. of Homeland Security to steal our privacy, including reporting your concealed carry license status and biometric facial recognition data. Missouri legislators are rightly upset about this and they view it as an attack on the 2nd Amendment. We need to keep it a top priority issue. Write letters to your local paper, expressing your concern and dismay that the MO DoR would be pursuing REAL ID thus breaking the law, compromising our privacy, and playing into the hands of the radical gun control agenda. Also, call or write your state rep and senator, demanding that they act on this right away. They can punish the DoR with budget reductions if they don't back down; they can pass laws to protect us while the legality of what DoR is doing is going through the legal process; and they can pass new laws to protect our privacy if the old ones aren't strong enough. Please act on this. We can't lose this one! Professor John Eidsmoe Explains "Interposition" (In support of Alabama Supreme Court Judge Roy Moore's nullification of a federal order to remove the Ten Commandment Monument from the state Supreme Court building. UPDATE! Another great hearing. We turned in well over 800 witness forms and had great in-person testimony. The next step is for Senator Nieves to schedule an executive session so his committee can pass the bill to the whole Senate. The Second Amendment Preservation Act is moving on a parallel course in both the Missouri House and Senate. That will speed up the process considerably. HB 436 is expected to be voted "do pass" by the House General Laws Committee next week. And the hearing for SB 325 is Tuesday afternoon at 3:00. I'll guarantee that it get's their attention when you plop 1000+ witness forms on the table at a hearing! UPDATE! We had a great hearing. We gave the committee over 1230 witness forms -- they were impressed. There were several witnesses testifying in person in favor of HB 436 and ZERO against.! This hearing will be in addition to the regularly scheduled Tuesday hearing. If you haven't done so already, fill out your witness form for HB 436. New Threat to CCW rights and privacy! The Missouri Department of Revenue is using new equipment that will "share" your personal information -- probably including information about people with conceal carry permits -- with Homeland Security. Have you seen the latest reason we need the Second Amendment Preservation Act? Once again we're learning that Congress doesn't have to pass a new law and the president doesn't even have to sign an executive order to undermine your 2nd Amendment rights. Reports are that the Missouri Department of Revenue has taken a grant to set up the new technology in local license offices across the state. A legal petition requesting a temporary restraining order on the implementation was filed today in Stoddard County and Judge Rob Mayer promptly signed it. Click here to read the legal petition. This petition is the first step to quashing the DOR's new privacy destroying plan. There's no doubt that the case will work its way up the legal system. We must insist that the courts respect Missouri's sovereign right to protect her people's privacy and right to keep and bear arms. The basis of the lawsuit and subsequent restraining order includes a 2009 law in which Missouri nullified the intrusive federal Real ID Act. Judge Mayer understands the purpose of that law because he was in the General Assembly when it was passed. A few lawmakers back in 2009 had the foresight to protect us from Real ID, and we need legislators to likewise step up to the plate and protect us from the new federal efforts that infringe on our 2nd Amendment rights! There's only one reason the feds want to know who owns guns -- so they can take them away with the time is "right". In Missouri, HB 436 and it's companion Senate bill, SB 325, are the only bills that will fully protect us from federal gun grabs. While you're on the phone with them, tell your Rep and Senator that you expect them to support HB 436 & SB325 -- the bills that totally forbids the enforcement of federal gun control in Missouri. HB 436 will eventually get a hearing -- please fill out the online witness form if you haven't already. We'll let you know when the hearing is scheduled. Congress doesn't have to pass a new law. The president doesn't even have to sign an executive order. Under existing law the Veteran's Administration can make a policy change that triggers a clause already in the Brady gun control act and strip veterans of their right to keep and bear arms. Read this story and this one. It's clearer than ever, they won't be satisfied to just ban "assault rifles", they won't stop until every citizen has been disarmed! The states must each rise to the defense of their people. Some Missouri Reps and Senators are doing just that -- and you can help. In Missouri, HB 436 and it's companion Senate bill, SB 325, are the only bills that will protect our veterans from the sort of infringements described above. Either this coming Tuesday or the following Tuesday HB 436, the Second Amendment Preservation Act, will have a public hearing in the House General Laws Committee. This committee is predisposed to support this bill, but we need to send a message of strong support that will resonate throughout the Capitol. The statists are getting a lot of media attention with their liberty-stealing, gun control bills, but the only legislation actually moving in the Missouri General Assembly will protect your right to keep and bear arms. The Second Amendment Preservation Act, which follows the example of Jefferson and Madison when they fought the unconstitutional Alien and Sedition Acts of 1798. HB 436 and SB 325 have been filed in the House and Senate, respectively. Based on sound constitutional principles, this bill completely nullifies all federal gun control measures, leaving the regulation of weapons within Missouri's borders to Missourians. HB 436 and SB 325 will get hearings as early as February 28th, but a public hearing is already scheduled for SJR 14 NEXT WEEK. Please plan to attend the hearing or fill out an online witness form, which we will print and hand deliver with hundreds of others to the Senate General Laws committee. Elevates the right to keep and bear arms to "inalienable rights" status. While you and I would and should maintain that a "right is a right", the courts don't look at it that way. The courts give more weight to some constitutional rights than others. Government actions infringing on what they consider lesser rights are not scrutinized as closely as the "weightier" rights. For example, when a citizen claims his rights are being violated by some law, the courts can "test" the law against two basic standards of review. The least strict standard is often referred to as the "Rational Basis Test", and the tougher standard -- the one that best protects your rights -- is the "Compelling State Interest Test". Listen to this explanation of the Rational Basis Test from the Institute for Justice. It explains that the Rational Basis Test is usually just a rubber stamp for government infringement of your rights. By making the right to keep and bear arms an "Inalienable Right", SJR 14 demands stricter scrutiny of gun control laws. The Second thing SJR 14 does is "obligate" the state to protect our right to keep and bear arms from all infringements -- including those from the federal government. Coupled with the "inalienable" provision, this clause will also help to defend any bills we pass to nullify unconstitutional federal gun control laws if those bills are challenged in state courts. This is an important provision that helps to empower state nullification of unconstitutional federal edicts. The final thing SJR 14 does is eliminate some confusing text from the Constitution, thus making the right to conceal carry more secure. Rep. Doug Funderburk and Sen. Brian Nieves' "Second Amendment Preservation Act" is the strongest and most principled protection of the right to keep and bear arms in Missouri!. Tenth Amendment Center article about HB 426. Right NOW, either plan to attend the hearing for SJR 14 on Tuesday, or fill out the online witness form..
Stay tuned and watch for announcements for the hearing for HB 436 and SB 325. The anti-gun contingent is not hiding their agenda -- they want to systematically and completely disarm all Americans. There has never been a stronger push for gun control. Between President Obama's executive orders and Congress' dismal record of defending the Constitution, it's clear that Missourians must throw up their own uncompromising line of defense of their God-given right to keep and bear arms. To that end, Rep. Doug Funderburk is about to file the bill with the strongest and most principled stand against unconstitutional federal gun control. The bill is currently in "blue back" form as he gathers cosponsors. Here's the text of the bill. There are other 2nd Amendment bills being considered by the Missouri legislature, and while their sponsors are to be commended for their efforts, those bills leave huge loopholes that will render them ineffective. What you can do: Call your Missouri state representative and ask him to cosponsor Rep. Doug Funderburk's 2nd Amendment Preservation Act by Tuesday morning. Here's the text of the bill. The fillibuster was a success! A deal cut that saves face for the supporters, but effectively kills the database this session. Look out next year, though. Some of the senators who took a stand this time around will no longer be in the Senate. There's a deal being considered by both sides... A favorable resolution may be at hand. More in a little while. There are two bills that would set up a statewide government computer database to track everyone who buys certain prescription drugs. The House version of that bill, HB 1193 (Frederick), has passed the House and will receive it's final debate -- and maybe passage -- before the entire Senate this afternoon. One of the reasons we don't like Obamacare is the database of our personal medical records it would establish. Can you believe that some members of the Missouri General Assembly want to do the same thing here in our state? Sen. Kevin Engler will be trying to pass HB 1193 on the senate floor and Senator Rob Schaaf will filibuster this bill, with the help of several liberty-minded senators who are listed below. Ask them to take as long as it takes to kill HB 1193 -- the Prescription Drug Monitoring Program Act. The filibuster may go all night long and into the morning, so check in occasionally and keep the emails coming! We will try to provide updates on various Facebook pages and at www.mofirst.org. This is an important battle -- please pass this on and stay tuned! Please also call your own senator and make sure he or she knows you don't want more "Big Brother" government intrusion! HJR 64 (Curtman) advanced another step in the House Thursday morning. It's poised for debate on the House floor while the Senate version is ready to debate on the Senate floor. UPDATE: The Senate Liberty Team got the $50M stripped from the budget! It was exactly 2 months ago we reported that House Budget Committee chairman Ryan Silvey rejected the $50 federal grant to set up a computer system that would facilitate the Obamacare Insurance Exchange. Missouri's budget bill has passed the House without the $50M and is now working it's way through the Senate. But now the same $50 million grant for a new Medicaid enrollment system has been placed back in the bill by the chairman of the Senate Budget committee, Kurt Schaefer. This money is coming from a grant that is specifically designated for creating the Obamacare Exchanges. We need to let Senator Schaefer know that the 71% of the voters rejected Obamacare don't want Missouri to take the bait -- we don't want anything to do with Obamacare! PLEASE CALL OR EMAIL Senator Schaefer and tell him to remove the $50 million Medicaid Enrollment System grant from the budget. This is URGENT -- The Senate will be working on this bill right away this week! We need the Senate to follow the lead from the House and defend Missouri liberty by passing the Obamacare nullification bill, HB 1534, instead of helping establish Obamacare with the grant money. House Votes 108 to 44 to Nullify Obamacare. Read more. In a Budget Comittee meeting, after grilling representatives from the Department of Social Services and receiving pitiful responses, Rep. Ryan Silvey declaired that the $50 M federal grant that clearly could be used to set up an Obamacare Exchange WILL NOT be in the Budget he takes to the full House. Act specifically declaring the the federal "Patient Protection and Affordable Care Act" null and void in Missouri, including specific constitutional rationale. More and more people are becoming wise to the ploys of those who use government's power for personal gain. Some are obvious -- eminent domain used on behalf of a private developer, for instance. Tax credits and other subsidies to private industry are also clearly a form of "crony capitalism" or mercantilism. 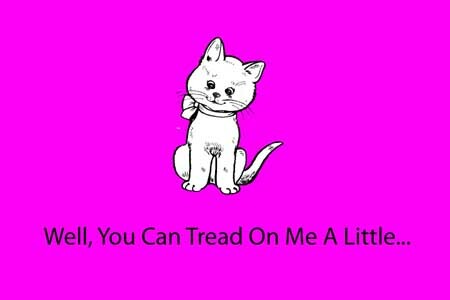 The grand-daddy mercantilistic scheme in recent history has got to be Obamacare, though! Like other forms of mercantilism, Obamacare not only results in special favor to well-connected private parties, but it also grows government's power and influence over our every day lives -- in this case it's the federal government. Patriots across Missouri are rising up on the heals of the tremendous (71%) Prop C vote in August of 2010 to demand that Missouri legislators take the next strep to protect them from this unconstitutional federal intrusion. Rep. Bahr's measures are the logical next steps. For the text, see the right side bar. Efforts to implement Obamacare are under way by Governor Nixon and his agencies. See the this link for the Missouri Health Insurance Pool's resolution to set up an Obamacare Health Inurance Exchange in an end-run around the state legislature and the vote of the people. Note: These measures have not been filed as bills yet because cosponsors are still signing on. We've been sold a bill of goods. If you weren't already upset over the passage of MOSIRA, you will be after reading this. "Missouri Science and Innovation Reinvestment Act"
COMMENT: This bill escaped some scrutiny due to the attention paid to the China Hub bill. Most of the concerns raised about government's role in the market, including constitutional issues, apply to both bills, however. COMMENT: MOSIRA is a classic example of mercantilism. It uses public resources derived from state and federal sources to supply special privilege to some private parties. MOSIRA interferes with the free market which typically results in misallocation of resources. It also empowers the state, agents of the state, and their friends. Thus, it promotes statism. "Leaders" who led the General Assembly down the path to passage of MOSIRA are not leaders at all. They have squandered their responsibility and should find other jobs outside the public sector. What are the stated goals of MOSIRA? Can MOSIRA be used to fund unethical research? What are the accountability measures? What pro-life amendments were offered during the perfection process? Constitutional Provisions violated when MOSIRA provides subsidies to private industry. Missouri needs economic development through economic freedom, not mercantilism!! Government does not “develop” the economy; it is only a drain on the economy. Sometimes the “drain” is a worthwhile investment, as in providing roads and keeping the peace, but usually government actually “undevelops” the economy. Mostly that's because government does not create private sector jobs or produce goods and services -- businesses do while government places regulatory impediments in the way of productivity and drains resources through taxation. It's that simple. That's why the the Missouri Constitution says that the “principle office” of government is to protect the liberty of the People to pursue economic opportunities (Art. I § 2) and do so without conferring favored treatment. Art III § 39(5), Art. X § 3. The China Hub legislation and other special subsidies violate those constitutional principles. Additionally, they produce unseen consequences to the economy, the extent of which we may never know. Speaker Pro-Tem Schoeller gave each House member a copy of Bastiat's “The Law” last spring. In this 1850 essay the author shows how French law was perverted into a tool for special interests to “plunder” the people. He pointed to America, which had thrown off the mercantilism of England, as an example of the power of liberty and a true free market economy. Sadly, Bastiat would be disappointed in us today, since we have in many ways returned to the very mercantilism that once enslaved the Colonists under the hand of King George III. LAW – A TOOL TO PLUNDER OR A TOOL FOR LIBERTY? In the Special Session, vote “No!” to government picking winners and losers. Vote “No!” on subsidizing Chinese manufacturers. End the tax credits, don't create more! Let's get government out of the way and let businesses compete in the fresh air of a fair and open market. UPDATE: The session ended and the senate failed to take up this bill. UPDATE May 12, 2011: Please fill out this Online Letter Form. to show your support for state sovereignty and the Missouri Firearms Freedom Act. We will print it and deliver it to senate leadership! UPDATE May 5, 2011: 411 witness forms were turned in and the General Laws committee voted to "do pass" the bill. It is now on the Senate calendar waiting for an opportunity for debate on the floor. “Compact” or contract theory of the relationship between the several states and between the states and the federal government. Rectifies, in part, misapplications of the interstate commerce clause of the U.S. Constitution. This bill is a good start at setting straight the proper use of the interstate commerce clause in many areas. We know of no resistance, other than the typical anti-gun resistance, our main challenge is the calendar. Session is over May 13th and the are major issues, including the budget and redistricting, vying for floor time. Do not make phone calls or send emails at this time. Please understand that there's no indication that Senate leadership is opposed to this bill, so be understanding about the tight schedule of these last two weeks of session and how hard it is to fit all the important pending legislation in. Application of the constitutional principles are limited to firearms and accessories. Certain types of firearms are exempted from the application of the constitutional principles arbitrarily. Phrase “particularly if not expressly preempted by federal law” weakens the application of the principles. This appears to be the only nullification bill with a chance of passing and the chances are relatively good, if we work at it. Even though the bill is not perfect (few are), it is a major advancement in the Principles of 98 (nullification) and the proper application of the interstate commerce clause. That clause is, perhaps the excuse for more unconstitutional intrusion into the live of the People than any other. The synergy between gun rights activists and proponents of sovereignty add vigor to this bill. Tomorrow morning (4/19/2011), the House Elections committee will hear HB 974 -- it will gut the electoral college if it comes to fruition. The net effect would be to eliminate most of the influence Missouri has on the selection of the US president. UPDATE - We truned in over 200 witness form from all over the state. The bill is dead and won't likely stand a chance with the House Elections Committee in the foreseeable future. Good job! I've been watching the debate over Prop B, the “Puppy Mill Initiative”, and have concluded that everyone's afraid to say what really needs to be said. That is, that domestic animals are property, and animals DO NOT have rights! To claim otherwise is to diminish mankind's station. People have inalienable rights from the Creator, but that same Creator gave man dominion over animals. He gave animals to man for food, companions and as beasts of burden – animals are not coequal inhabitants of His creation. God, however, also prescribed proper treatment for animals. Not muzzling an ox while he is treading, or unequally yoking two beasts of burden, are examples. From these instructions about treatment of animals we see that the moral thing to do is treat animals humanely. In a world where most U.S. Senators think their main job is to channel "largess" -- earmarks and the like -- back to their home state, it is refreshing to see one candidate properly define the job he hopes the People hire him for. Since securing liberty is the principle office of government (MO Const. Art. I § 2) and since government's role in education is declared to be for the purpose of promoting liberty (MO Const. Art. IX § 1a) , it behooves us to make sure the no part of education reform undermines liberty in the process. While it's true that an entire article of the Missouri Constitution is devoted to education, and that article requires that a minimum of 25% of state revenue be spent on education, education is not state government's number one priority. FOUNDATIONAL PRINCIPLE: Missouri's education policy must be crafted in a way that respects and does not diminish the liberty of the people. Otherwise, Missouri government will "fail in its chief design". In all of Missouri history there have only been 28 statute changes placed on the ballot by the initiative petition process. Of the 12 that passed, Proposition B had the narrowest margins. A shift of only 8/10 of 1% would have changed the outcome. Some of the provision of Prop B are blatently infringements on the rights of some Missourians. What should be done? The Missouri General Assembly has an obligation to repeal at least part of Proposition B in spite of the fact that it was just passed by the voters. Each legislator has a constitutional responsibility to support such repeal regardless of how his district voted on the proposition last November. To do less would be a violation of his oath of office. Admittedly, that's a bold claim. After all, the people have spoken and we should respect their collective will, shouldn't we? There have been 372 initiatives on the Missouri ballot since 1910. Click here for a live interactive database of Missouri Ballot Initiative history. On November 2, 2010 the people of Missouri spoke. In the narrowest voter approval of a statute change ever, 51.6% of those Missourian voting approved a law described by a prejudice ballot title. The Missouri General Assembly has an obligation to repeal at least part of Proposition B in spite of the fact that it was just passed by the voters. The courts have a similar obligation. That might sound like an odd position from someone who may very well be Missouri's most outspoken proponent of the citizen's right to the initiative petition process. After all, the people have spoken and we should respect their collective will, shouldn't we? Our state constitution says “The people reserve power to propose and enact or reject laws and amendments to the constitution by the initiative, independent of the general assembly.” (Art. III § 49) This incredibly important provision is designed to afford the people a “check” on the power of government -- a way to override or bypass officials who have been oppressive or unresponsive to the will of the people. There is, however, another great characteristic of a constitutional republic – we are governed by the Rule of Law. That means that there are some laws that not even a majority of the people have authority to enact. Those would be laws which diminish God-given and constitutionally protected rights. So on one hand an American Constitutional Republic protects the people from the tyranny of a few by ensuring that all political power remains vested in the people and on the other hand it protects the individual from the tyranny of the majority through the principles of the Rule of Law. If one takes the arguable position that the state has an interest in the well-being of the property (dogs) of individual citizens, and if there were something special about the number 50, then there might be some state interest that would temper the individual rights mentioned. But 50 is an arbitrary number with no meaning what-so-ever. 51 or 60 or 200 breeding dogs can be kept in equally healthy and humane conditions as 5 or 10 or 50. There is no relationship between the number of animals a breeder can have and the well-being of those animals. Now, a limit on how many dogs you could have per handler, or how much living space must be afforded each dog would affect their well-being, and some might claim the state has an interest in those “per dog” conditions, but as long as each individual animal is afforded an adequate living arrangement, why should the number of dogs matter? So the 50 dog limit is blatantly unconstitutional; but what obligates the state's law-makers to repeal it? What obligates the courts to over-turn the law? Each of our legislators and each judge has sworn an oath to support and defend the constitution. They have obligated themselves to secure the rights of the people of Missouri – including those who want to earn a living with more than 50 dogs. It is their job to interpose on behalf of the victims of the tyranny of the majority. To do less is a violation of their oath of office. They must repeal the unconstitutional portions of Prop B. 1) All political power is derived from and vested in the people. 2) We are governed by the Rule of Law, therefore even a majority of voters have no jurisdiction to destroy the constitutional rights of individuals. 1) The citizen's ballot initiative is one of the checks on the Tyranny of the Few. 2) The Rule of Law (e.g. the constitution) is a check on the Tyranny of the Majority. The constitution trumps the voter's approval of a statute change which infringes on individual constitutional rights. Mo Const. Article I, Section 2.
" That all constitutional government is intended to promote the general welfare of the people; that all persons have a natural right to life, liberty, the pursuit of happiness and the enjoyment of the gains of their own industry; that all persons are created equal and are entitled to equal rights and opportunity under the law; that to give security to these things is the principal office of government, and that when government does not confer this security, it fails in its chief design." State legislators took an oath to uphold Article I, Sec. 2, therefore they are obligated to repeal the unconstitutional provisions of Prop B -- they have no choice, no matter how their constituents voted on the ballot measure. What!? A year in prison for filing horse's teeth? 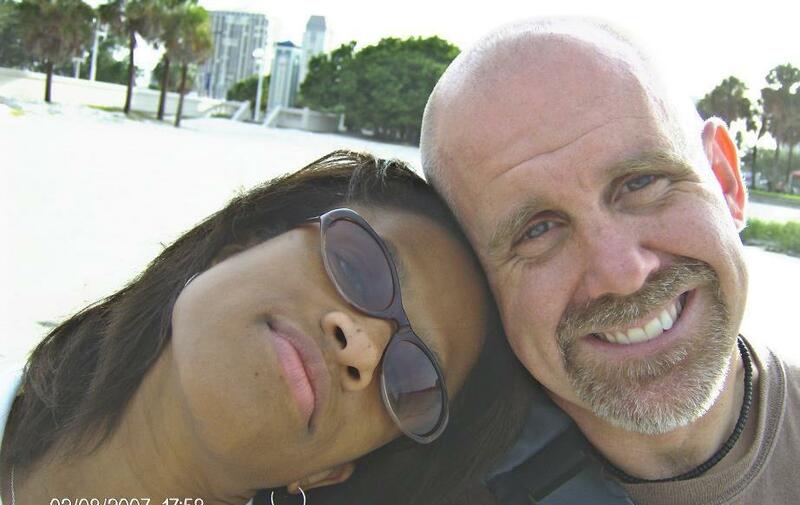 Attorneys Dave & Jennifer Roland have been fighting for Missouri liberty since they moved to back to her home state and began work at the Show-Me Institute in 2007. Their experience fighting eminent domain abuse at the Institute for Justice has been put to good use in the property rights fight here. Now they enter a new and exciting phase of service with their new Freedom Center of Missouri where they will be legal advocates for liberty. And, boy, do we need them! Read about their first case here. Oklahoma – October 27, 2010 -- Update: The radio ads worked and the measure passed! Oklahoma has a hostile environment for citizens seeking to use the petition process to deal with a legislature which is either oppressive or unresponsive to the people. The people are given only 90 days to collect almost twice the number of signatures per capita as here in Missouri. What's more, the Oklahoma AG tried to send three petition activists to prison over trumped up charges based on a law that has since been found unconstitutional. Paul Jacob, of Citizens in Charge, was one of the "Oklahoma Three". We're glad he's not in the pokey because he's out there every day fighting for the liberty of Americans all across the nation. Paul is probably the one guy most responsible for bringing term limits to the many states now fortunate enough to enjoy them -- including Missouri. Citizens in Charge is focused on bringing the citizens initiative petition process to states not yet blessed with it, and defending it where it already exists. The current opportunity in Oklahoma blends both term limits and the petition process. Tools that help to maintain a republican form of government - that is, one in which the people are still in charge. A ballot measure to create term limits for the state-wide office holders there is very popular. A new ad campaign will tie that issue with another ballot measure to make the almost impossible petition process there more reasonable. Paul needs to raise about $15,000 in the next couple of days to finish up his media buys for a radio spot. That's not much if we all will pitch in a little. Besides helping out a guy whose done so much for our state, passage of those two ballot measures in OK next week will set a good example for the Missouri legislature to follow. We need term limits on all our state-wide officials AND we need to fix our petition process, too, so it's not just available to the well-heeled interests. Can you donate a few dollars to help someone who has helped us so much? More on the ballot issues. Update: The radio ads worked and the measure passed! Many Thanks to all who helped!! Missouri taxpayers footing the bill for well over half a billion dollars in tax credits each year. Most of those credits are nothing more than corporate welfare - mercantilism. Missouri State Auditor, Susan Montee, determined that the state's tax credit system is not producing a reasonable return on the taxpayers investment. Her analysis was only of that which can be observed and measured, but there are many unseen effects from such tinkering with markets. If the "unseen" effects could be measured, the results would be even more disastrous. April 2010 audit of Missouri's 61 tax credit programs. Video: What is an American Constitutional Republic? Ron Calzone explains what a "constitutional republic" is at the Day of Discovery in Hanibal, MO May 8, 2010. Eminent Domain - also at the Day of Discovery in Hanibal, MO May 8, 2010. Conclusion and efforts to preserve the people's reserved power to the petition process. Support their effort to provide a family friendly source of conservative information. Lists all the ballot measure between 1910 and 2008. Create data sets from query criteria you select with a few clicks of the mouse. How did measures proposed by the General Assembly fare against those placed on the ballot by petitions? Which would have passed or failed if various super-majorities were required? Read about the importance of the petition process to a healthy constitutional republic. Over 100 petitions were submitted to the SOS for her approval to circulate. Only about 24 were actually approved for circulation. Of that 24, there are only 14 distinct proponents - only about 15 petitions of the 24 were ever candidates for circulation. Only 4 petitions were filed with the SOS on May 2nd! Missouri's legislative process is broken. While that might be comforting to liberty loving citizens who cringe every time they hear a new law has been passed, make no mistake about it, the broken process is not gridlock that prevents freedom-stealing laws from being passed – in fact, the process often promotes them. It is a misconception to believe that the legislative process should be about "compromise". Compromise too often includes a surrendering of principles or capitulation to a more powerful force. In a civilized society – one in which the people have many more shared values then divergent ones – the goal of governance should be to find common ground, not force compromise.
" Partisan hacks on both sides line up like medieval armies and charge one another with swinging swords and clubs. The people – common citizens - are caught in the middle. More often than not, their liberty suffers." May 6, 2010 -- General Assembly Attack on Citizen Lobbying! Missouri House votes to make non-registered citizen lobbyists felons! Download the short eval HERE. Missouri First eval of SB844 HERE. ALink to the bill: SB844! The Petition Rights Protection Act Submitted to SOS! Q. How long do you wait for the General Assembly to fix the problems with Missouri's petition process? A. Not one more moment! SB 818 seems hopelessly mired in politics. Although there are some fine statesmen, like Sen. Jim Lembke, there aren't enough to overcome the apathy or hostility toward the people's constitutional right to the petition process. 1) Make respect for the voters the primary consideration in the petition processing procedure. 2) Addresses fraudulent practices in the petition process. 3) Streamline Ballot Title litigation, limiting it to 3 1/2 months. The deadline for collecting almost 100,000 valid signatures is May, 2012. Your Right to Petition for a Redress of Grievances Under Attack! End of Session Update: All the anti-citizen's initiatives died in the senate! Rep. Parson is running for the state senate, though, and if he is elected will probably push for the same restrictions from that side of the building. Update to Update: Rep. Parson won is bid for state senate. He will likely be in the senate for at least 4 years. Will he continue his attack on the petition process? There a handful of bills attacking your right to petition, but the ones that are moving through the legislative process are sponsored by Rep. Mike Parson. HB 1788 has passed the House and will have a hearing in the Senate elections committee on Monday, May 3rd! HB1788: Although the supporters of this bill claim that it is designed to keep out of state interests from coming to Missouri and changing our laws, it actually does nothing to that end. Instead, it hinders the right of Missourians to place an issue before the voters so they can decide. The bill arrogantly pre-supposes that voters can't be trusted. Petition circulators are "agents" of the petition proponent, just like a printer or radio announcer who helps a politician get his campaign message out. Ask the very politicians seeking to restrict your rights to hire such an agent if they would accept the same limitations on their campaign and they'll say no every time. The bill's prohibition against pay based on the number of signatures collected is really a prohibition against performance based pay. It could even be interpreted in such a way as to to prevent the firing a petition circulator paid by the hour but wasn't collecting any signatures at all. Until the courts rule on some test cases it will be anyone's guess how this provision will be interpreted. Who wants to be the first to collect hundreds of thousands of signatures only to find out the government won't recognize them? Finally, if the politicians are going to prohibit the people from collecting signatures on more than one petition at a time, perhaps they should also prohibit themselves from filing more than one bill at at time! This is the most blatantly unconstitutional provision of them all. The first two provisions have been repeatedly found unconstitutional when other states tried them and no other state has been arrogant enough to even try the last! This bill is clearly unconstitutional and designed to effectively end the petition process, not clean it up. Shame on you, Rep, Parson! What happened to your oath to support and defend the constitution? ACTION ITEM: Download the witness form in the right column and email it in so we can present it to the committee hearing on May 3. Rep. Mike Parson has also sponsored HJR 63 a constitutional amendment that will greatly increase the number of signatures required to place a question on the ballot. The increase difficulty and expense will take the petition process out of the reach of grass-roots efforts. This measure will get it's final passing vote in the House any day and then be sent to the Senate. Click here to read about the importance of the petition process to a healthy constitutional republic.
" The people reserve power to propose and enact or reject laws and amendments to the constitution by the initiative, independent of the general assembly, and also reserve power to approve or reject by referendum any act of the general assembly, except as hereinafter provided." "When the people find they can vote themselves insurance coverage, that will herald the end of the republic." Listen to the following interview in which Judge Napolitano explains why ObamaCare is unconstitutional and gives real solutions to this massive federal takeover of our personal liberty. In 2000, President Bush announced his prescription drug plan. It paved the way for ObamaCare. President Bush's No Child Left Behind Act of 2001 paved the way for President Obama's Race to the Top. End of Session Update: SB818 was allowed a little more time on the sentate floor near the end of the legislative session, but majority floor leader, Sen. Kevin Engler, would not allow the bill enough time to move. Engler is a vocal opponent of the people's right to initiative petitions. SB 818 was given a meager 45 minutes of floor debate time, where some of the Republicans - namely Sen. Tom Dempsey and Sen. Kevin Engler - were more of a problem than the Democrats. Dempsey offered an amendment without the courtesy of first asking the bill sponsor. It simply muddied the water and wasted precious floor time. Engler made Lemble lay the bill over. It is hard to tell if the bill will receive more floor time before the end of session. In the mean time, bills that would effectively strip Missourians of their constitutional right to the initiative process are advancing in the House. HB1788 has passed and is due for a hearing in the Senate elections committee and HJR 63 was perfected and is about to pass the House. Get your "Concealed Weapons Encouraged" sign here. 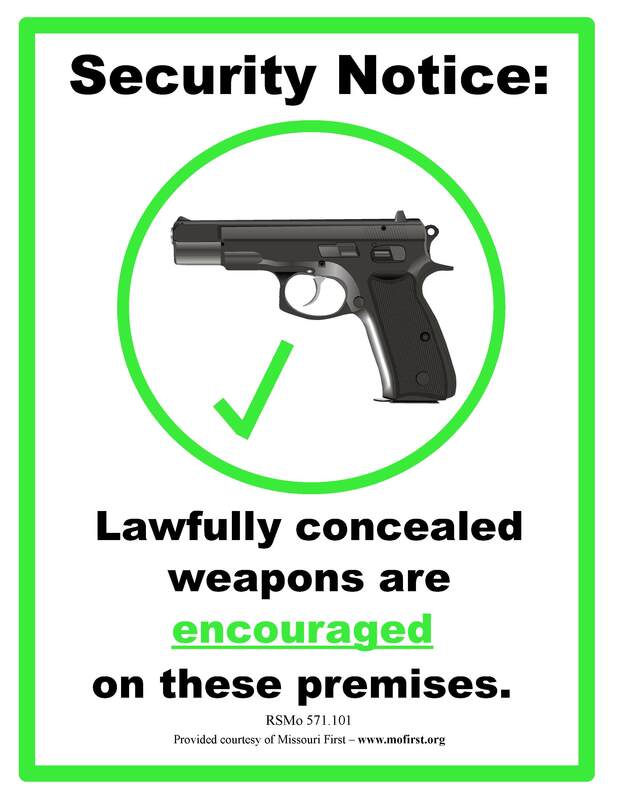 Missouri First is proud to announce the release of a sign designed to encourage concealed carry users and discourage criminals. More importantly, it allows property owners to make a statement. We all need to remember that the point of the second amendment is not to protect hunting rights or to make our communities safer, although it does have that effect. The real point of keeping the populace armed is to deter the government from oppressing the people. Please print and distribute freely! Missouri Senator Wants to Protect Economic Freedom! End of Session Update: This resolution was given a brief hearing, but most of the General Laws committee left the hearing room before it came up. No further action was taken. There doesn't seem to be much interest among SOME senators in preserving economic freedom. Economic Freedom resolution filed by Missouri state senator Lembke. Article I, Section 2 of the Missouri Constitution defines the primary role of Missouri government as that of protecting our property rights - including life, liberty and estates. Senator Lembke's constitutional amendment would make it clear that those protections include our economic freedom, which, of course, is the bulwark of our other liberties. Article I, Section 2. That all constitutional government is intended to promote the general welfare of the people; that all persons have a natural right to life, liberty, the pursuit of happiness; that all persons have a natural right to economic freedom and the enjoyment of the gains of their own industry; that all persons are created equal and are entitled to equal rights and opportunity under the law; that to give security to these things is the principal office of government, and that when government does not confer this security, it fails in its chief design. “The economic policy dominant in the Europe of the seventeenth and eighteenth centuries, and christened "mercantilism" by later writers, at bottom assumed that detailed intervention in economic affairs was a proper function of government. Government was to control, regulate, subsidize, and penalize commerce and production. What the content of these regulations should be depended on what groups managed to control the state apparatus. Such control is particularly rewarding when much is at stake, and a great deal is at stake when government is "strong" and interventionist. In contrast, when government powers are minimal, the question of who runs the state becomes relatively trivial. But when government is strong and the power struggle keen, groups in control of the state can and do constantly shift, coalesce, or fall out over the spoils. Is mercantilism America's greatest threat? One of the most distinctive features of the American system of governance is our commitment to two basic concepts: First, as the Declaration of Independence says, man's rights are “endowed by their Creator”, not the state, and second, that all governmental power is derived from the people themselves. The very next section of the Missouri Bill of Rights makes it clear that the “principle purpose” of government is to make sure these seminal principles are always honored. Current eminent domain policy violates the basic concepts of the separation of powers. Unfortunately, most of the proposed solutions continue to violate those same principles. Mixing them up results in all sorts of problems! An understanding of the heritage of the American concept of property rights is necessary before we can properly deal with that issue. Equipped with that understanding, our concerns will go far beyond any individual neighborhood or development – we will be concerned about the very integrity of our system of constitutional governance. Any social compact that permits the stronger, more powerful to forcefully take the property of the weaker members of society will eventually allow similar takings of “property” of a more personal nature, like life and liberty. Let The Senate Try Impeachment Cases – Like it Used To! Can you believe it? Our state is the only one with a bicameral legislature that allows the Supreme Court to hold impeachment trials! All other states, but Nebraska, which is unicameral, and Oregon, which has recalls rather than impeachment, allow one legislative branch to impeach and the other, usually the senate, to hold impeachment trials. Of course, the U.S. Constitution also provides for senate impeachment trials. All of these other states recognize the wisdom of the founding fathers and the need to employ “checks and balances” into our system of government. As it is now, our state constitution allows the judicial branch to police itself! If that sounds like the fox guarding the chicken coop, that's because it IS! Now Rep. Ed Emery has sponsored a resolution to put a constitutional change before the voters on the November ballot. The change will simply roll back our constitution to it's pre-1945 condition with respect to impeachment trials and put us into conformity with the rest of the country. State university flies the United Nations flag! Join Missouri First - help us in our fight for constitutional government! We live in a time when a government agency or public school is very likely to face a constitutional challenge if it acknowledges God, so you might be surprised to find out that the United States Constitution itself acknowledges God. In fact, the constitution doesn't simply make an ambiguous reference to a generic “supreme being” – it honors Jesus Christ Himself, and submits the nation it defined to Him! “Where?”, you ask, “I've read the entire constitution and never noticed it.” It's there in unabridged copies and we'll take a look at it, but first a quick lesson in reckoning time. This practice continues even today in many parts of the world. Until the post WWII Japanese constitution, the emperor was considered a sovereign, divine ruler. Although Emperor Hirohito was prompted by MacArthor to renounce that status, the practice of reckoning time by the current monarch continues. For instance, the year 2005 is officially year 17 of the Heisei Era of the Emperor Akihito. Until 2002, the Japanese Patent Office still used this system. It was no different right before the founding of the United States. The 1774 “Declarations and Resolves” by the Continental Congress complained of long running injustices from the mother country since “thirty-fifth year of the reign of King Henry the Eighth”. By April 19, 1775, however, the jaded colonists were distancing themselves from the current monarch, King George - that was the day of the “shot heard 'round the world” in Lexington, Massachusetts. In the town square that morning the King's Major Pitcairn was being faced down by about 70 colonists. He shouted, "Disperse, ye villains Lay down your arms in the name of George the Sovereign King of England". He was met with the response "We recognize no Sovereign but God and no King but Jesus!". The forthcoming Declaration of Independence hammered this point home by making it clear that man's rights did not come from an earthly king, but that they were “endowed by their Creator with certain unalienable Rights” and that “That to secure these rights, Governments are instituted among Men, deriving their just powers from the consent of the governed”. The Founders did not claim to be totally free from a king – just free from an earthly king! It was no coincidence that twelve years later the document that defined the new relationship between the states and defined the role of their general government would culminate with an acknowledgment that Jesus was their King! Article VII, known as the “subscription clause”, says the drafting of the Constitution was “done in Convention by the Unanimous Consent of the States present the Seventeenth Day of September in the Year of our Lord one thousand seven hundred and Eighty seven”. Some will claim that “that's just the way people talked in those days”. They are right, in part, because it was more socially acceptable to honor God back then, but a look at other documents from that era proves that spelling out “the year of our Lord” was not routine. Virginia's constitution, for instance, fixed it's inception “on Monday the sixth day of May, one thousand seven hundred and seventy six”. How can anyone who understands American history claim that it is unconstitutional for the state to acknowledge God when that same Constitution declares His Son King of the Land! Who can impeach a judge in Missouri? Why does the power to impeach rest with the house of representatives alone? What happens once articles of impeachment have been approved by the house? What are the possible penalties if found guilty? For what reasons can a judge be impeached? Has Judge Ohmer committed an impeachable offense? Impeachment is the constitutional process used by the legislature to ensure that the other two branches of government do not overstep their authority. First, understand that government derives it's power from the governed. The structure of American government is designed to make sure the people maintain ultimate control. Missouri government, like the federal government, is divided into three branches – the administrative, legislative, and judicial. Each branch is limited by the constitution to specific tasks, and each branch serves as a “check and balance” to the other two branches in order to ensure that no branch usurps the liberty of the citizens. Simply put, impeachment is the constitutional “weapon” the legislature uses to protect the liberty of the citizens and maintain it's own share of power among the three branches. In addition to impeachment, the Missouri constitution provides for disciplining judges by the Commission on Retirement, Removal and Discipline of Judges (Article V, Section 24). The commission's purpose is to maintain the integrity of the courts, but not to maintain the balance of power among the three branches of government, so it is not the proper venue to deal with a judge who usurps the power of the legislature. The legislature's power is divided among a much larger number of individuals, so the likelihood of despotic rule from that branch is relatively small – it is the body that is closest to the people. On the other hand, the power of the administrative and judicial branches resides with but a few men who are less accessible to the common man. Our representatives, like judges, have sworn to defend and uphold the constitution. Impeachment is a solemn responsibility neither to be shirked nor abused. Impeachment is neither a criminal procedure nor intended primarily for criminal offenses, so penalties are limited to removal from office. A court decision which is clearly in opposition to the plain meaning of the constitution made in favor of personal opinion or in deference to political allies is “corruption in office”. A decision like that is in violation of the judge's oath to defend the constitution and strikes at the seminal principles of “separation of powers”. If a the judge's motives are not malicious, but he simply misunderstands the clear dictates of the constitution, then he is guilty of “incompetency”. MO Const. Article II, Section 15 "Every senator or representative elect, before entering upon the duties of his office, shall take and subscribe the following oath or affirmation: I do solemnly swear, or affirm, that I will support the Constitution of the United States and of the state of Missouri, and faithfully perform the duties of my office, and that I will not knowingly receive, directly or indirectly, any money or other valuable thing for the performance or nonperformance of any act or duty pertaining to my office, other than the compensation allowed by law." Order “Restraining an Overactive Judiciary” by David Barton From Wall Builders (It's about 60 pages and only $6.95) This is an excellent, easy to read book that uses a lot of quotes from the founding fathers to explain the importance of “separation of powers” and the role impeachment has played in maintaining that separation. Accused of bribery in order to secure a clerk position for his son. Accused of finding no bills of indictment against Confederate soldiers, refusing to give or take the loyalty oath required by the constitution, etc. Accused of uttering false erroneous, and dangerous decisions and opinions, subversive of the valid and binding provisions of the constitution, and for intentionally neglecting to require loyalty oaths by jurors. Charged with “allowing indictments to create costs” by granting mileage allowances to jurors. Accused of personal involvement with a woman seeking a divorce in his court and improperly advising her. Can you believe it? The Missouri constitution can be amended with a simple majority vote of an uninformed electorate! Maybe the next amendment to our state's supreme law should require a 2/3 vote for changes to this seminal document. UN Flag Flying Over Missouri University! Yes, that's it, right between the U.S. flag and Missouri's flag. Viewing from this direction, preeminence is indicated by the left most position. What is the university trying to tell us? Considering the importance and significance of flags, we must ask, "Is it right to fly the flag of the United Nations over the most eminent university of our great state?". more. Why Do We Need Sovereignty for Missourians? What's happening to America? You don't have to be very old to remember when things were different. It wasn't long ago when 'unspeakable' things weren't spoken! Now it is hard to escape the decadence. In the eyes of many Americans, the distinction between right and wrong has been blurred; our culture is changing faster than it ever has. Why is this, and what will be its end? Cultures foreign to the American way now permeate our society - this is the natural result of unbridled immigration and humanism's step-child, multiculturalism. This doctrine declares that all cultures are equally acceptable, but you need go no farther than the court dockets to learn otherwise. more. Join us in our effort to secure Missouri Values. There are things you can do!